Dedicated to the "Father of the Blues," Handy Circle can be found on Google Maps (inset). But you won't find it if you take a walk down Beale Street. 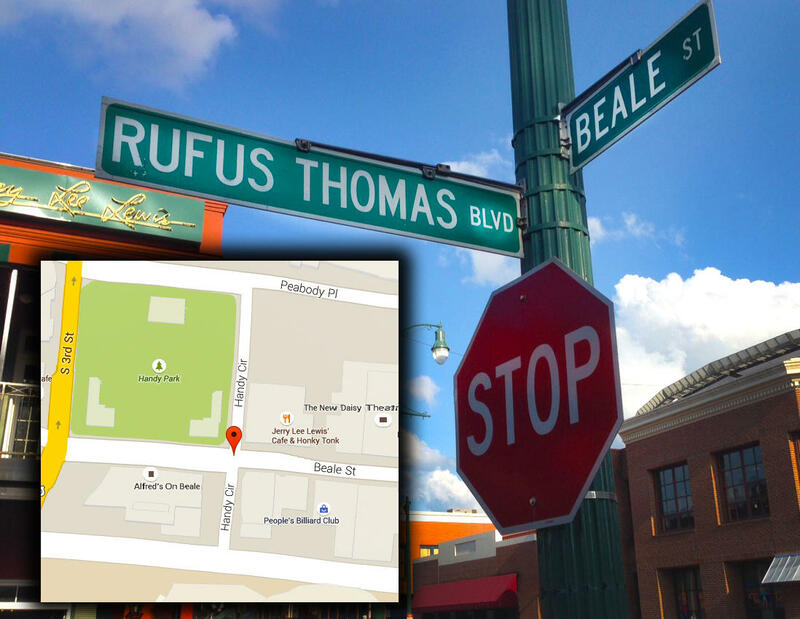 The sole street corner where Handy's name would be found says "Rufus Thomas Blvd." Memphis is a city of legendary music and musicians. It's time our streets get some soul. Mayor Memphis A.C. Wharton recently proposed renaming a section of Third Street for the late bluesman , B.B. King, who started his illustrious career in Memphis. Should our city's map get a more comprehensive musical makeover? Today's Culture Desk segment proposes that street names aren't as sacred or traditional as many would think. Many Memphis streets are named after wealthy landowners or developers, not founding fathers, war heroes or influential citizens. If we think of a street name as an honorific or tied to some forgotten chapter in our city's history, we would have to reconsider Kenwood, the neighborhood off Highland. The entire collection of neighborhood streets -- Kenwood, Shirlwood, Johnwood, Philwood, Charleswood -- were named after the real estate developer's grandchildren. Sure, it's cute. Whimsical, even. What's not cute is that that while Elvis Presley got a major street named after him in 1972 (while he was still alive) it has taken more than 40 years for the city to even consider naming a major artery after an African-American musician. A number of musicians have "honorary" or "memorial" streets named after them in Memphis. The names of Isaac Hayes, Jerry Lee Lewis, Al Green and Sam Phillips can be seen on a handful of special signs, but not on maps. There is a cynical practicality to that: no businesses have to change the address on their letterhead. The city saves money on signage. It's a gesture that says: we will honor our great musicians as long as it's not inconvenient to anyone. We rarely consider who the streets are named after in the first place, just that they have always been there. But these names also represent the values of the times. For most of the Civil War, Memphis was occupied by Federal troops. As a bastion of freedom, our town became the racially diverse city it is today because many enslaved people sought refuge here. But after the Civil War and long into the 20th Century, a succession of mayors remade Memphis in the image of the post-Reconstruction South. Streets and parks were named for Confederate generals and politicians who represented white, southern values and segregation. One mayor set his sights on Pigeon Roost Road. It had once been an ancient Indian trail that led into the city. It's name came from the enormous amount of passenger pigeons that roosted in the area's trees. But the passenger pigeon was hunted to extinction, and only the road's oldest residents complained that renaming the street was erasing history. And so Pigeon Roost Road became Lamar Avenue, named after Mississippi congressman Lucius Quintus Cincinnatus Lamar, who had the honor of drafting Mississippi's Ordinance of Secession in 1861. He was also the Confederacy's minister to Russia. While Lamar did have an illustrious post-war career, eventually getting elected to the U.S. House of Representatives and sitting on the United States Supreme Court, he also believed in white supremacy and that black people shouldn't have the right to vote. Let us now consider a modern day alternative that speaks to contemporary values. A Sam Phillips Avenue, for example, would honor a Hall of Fame music producer who recorded black and white musicians with equal respect and admiration during the era of segregation. A Dewey Phillips Avenue would honor a famous local deejay who gave black and white musicians equal play on the radio during a time when even the airwaves were segregated. What better way to enter the modern day City of Memphis than on major streets dedicated to champions of cultural diversity? Streets that also reflect the city's musical heritage and fortify the mythos that Memphis is America's greatest place to explore music. To paraphrase Shakespeare: "Would a street by any other name still sound as sweet?"